The Kugel Hernia Patch was designed for use in open ventral hernia repair. The patch was used to help eliminate the tension and strain on surrounding muscles and ligaments which reduced discomfort after surgery. What does the Kugel Patch do? 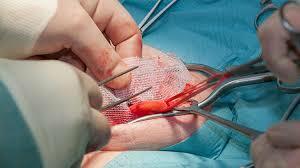 The Kugel patch is designed to be inserted through a small incision. Once inserted properly the patch is supposed to lie flat against the abdominal wall which helps reduce the number of sutures required. The patch helps the hernia to close and the tissue to heal. The patch, also known as The Kugel Composix mesh patch, holds a small plastic ring embedded in the patch that allows it to be folded over. The ring is known as the memory recoil ring. Once the ring is in the abdomen it is deployed. If you are experiencing any of these symptoms or any other unusual symptoms after surgery you should consult with your doctor immediately. What are the possible problems of the Kugel Patch? The breaks can be caused by stress of the placement of the patch under the abdominal space. These complications may require surgery or at the very least additional medical treatment. A bowel perforation is when an opening forms in the intestinal wall, the contents may flow into the abdominal cavity. This is usually caused by injury, illness and bowel obstruction. Some patients have experienced bowel perforations due to the breaking of the memory recoil ring which then can migrate through the abdominal wall. Failure to treat bowel perforation in a timely manner can lead to sepsis (a blood infection). If not treated quickly, bowel obstructions can lead to bowel perforation, gangrene, or infection. A chronic enteric fistula is an abnormal connection that forms between two parts of the intestine. Occasionally, one fistula opening closes while others remain open, this results in an accumulation of bowel contents in the cavity. When this happens an abscess or infection may develop which can spread to the bloodstream. There are few serious symptoms for chronic enteric fistulas, but the most common is major abdominal pain. If you experience any form of abdominal pain after a hernia surgery that requires the Kugel Hernia patch, consult with your doctor immediately. The Kugel hernia patch side effects can be severe and you should seek legal help if you or a loved one have suffered do to taking this medication. Please call me today at 916.921.6400 or Contact Me.